World War II, RAIDING SUPPORT REGIMENT, Captain Harry Boddington, CD, tells of his days with one of Britain's World War II special service groups. Captain Harry Boddington, CD, tells of his days with one of Britain's World War II special service groups. The personnel of the unit were entirely volunteers. These volunteers were drawn from many varied allied nationals. The bulk of the unit being made up of Rhodesians, South Africans and British. As a matter of interest, the regiment was adopted by the City of Johannesburg in 1943. Its C.O. was a South African and the second in command a Rhodesian. The Raiding Support Regiment consisted of four squadrons and a regimental headquarters. These squadrons were armed with different supporting weapons. "A" squadron armament consisted of .50 Vickers heavy machine guns. These guns were mounted on jeeps. "B" squadron was armed with three inch mortars and "C" squadron with anti-tank guns. "D" squadron; and of this squadron I was a member, and although this article purports to be a history of the Raiding Support Regiment, it is in effect a history of "D" squadron, of the Regiment; was armed with 75 millimetre gun Howitzers and it consisted of three, four gun batteries. The 75 millimetre gun Howitzer was chosen because of its adaptability in mountain warfare and the fact that it could be broken down into several readily assembled pieces which could be dropped from aircraft by parachute cannisters. All regimental personnel were qualified parachutists and trained in mountain warfare and the handling of small boats, these ranged all the way from Kayaks to power operated units. Landings from M.T.B. 's and L.C.I. 's also formed a large part of the training. Theatres of operation in which the unit saw action were the Dalmatian Islands, Yugoslavia, Greece and Albania. Some examples of the type of operations: The first operations were series of island hops up the Yugoslavian coast and through the Dalmatian Islands. These were carried out in conjunction with the Yugoslav partisan units and it wasn't too long before the partisans established complete control of this chain of islands. The regiment took part in the capture of the Greek island, Corfu, and in landings in Albania. Elements of the regiment operated throughout the war with guerilla units in Greece and other elements of the unit operated with guerilla elements in Yugoslavia and Albania. At times, the action in Yugoslavia took on very confused nature. We worked mostly with the partisans, sometimes with the Chetniks and always against the Ustashi, a group of axis supporting Yugoslavians. Following one of the larger partisan disasters the unit was broken up and directed to make their own way out to the north, in small groups of three or four. North of Belgrade, near the Bulgarian border, after about a month in the mountains living off plunder, booty and loot my group were captured by the Bulgarian forces, finally arriving at a makeshift prisoner of war camp on the outskirts of Sofia, The guards were the sloppiest, most unenthusiastic bastards we ever saw and whilst being transferred to still another camp, myself and three of my buddies simply walked away the most uninspiring 'escape' of the war. We wandered north-east for about a week when we were picked up by the forward elements of the advancing Soviet forces who, regarding us with unprecedented suspicion, promptly threw us, their gallant allies, into the smelliest jail you ever saw. Apparently they did not believe our story because they said that the Bulgarians couldn't catch a cold, much less British troops. They were finally convinced and, after capturing Sofia, flew us back to southern Italy where we rejoined our units. 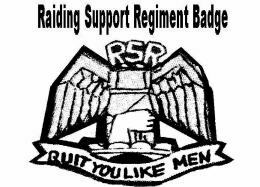 As hostilities in Europe approached a climax the presence of the Raiding Support Regiment in Yugoslavia was deemed to be politically undesirable and we were ordered back to civilization. After the peace in Europe, the regiment was stationed at Zara which is a coastal city in Yugoslavia, south of Trieste. We remained in Zara under allied military control acting as occupation forces for several months and then handed over the control of this city to the Yugoslavs and the unit returned to Italy. The war in the Far East was still going on and it was the desire of the allied command to send the regiment to the Far East as a complete unit. This was to be done on a volunteer basis. The bait was that every member of our unit would get 28 days special home leave. The catch was that by this time most personnel had received a tentative demobilization date and this demobilization date would have to be deferred for 12 months. The thought of 28 days home leave won out. Almost all members of the unit signed a deferment of their release and we were sent to our various countries on 28 days home leave. The British section were to rendezvous at Harrogate in Yorkshire which was at that time an airborne regimental depot, this was of course after the 28 days leave was complete. From there we were to be shipped to a regimental staging area in India. This went off well except that as our leaves ended, so did the war in the Far East. So we remained at Harrogate for several days until it was decided what we should do. The decision finally came and this consisted of a choice for the unit personnel. First of all, they could retain their deferment of release and be transferred as instructors and senior N.C.O. 's or officers for the 10th airborne battalion which at that time was just being formed. This battalion incidentally, later saw service in Palestine, now Israel and had a rather rough time of it there. The second choice was to cancel the deferment and the regimental personnel would be employed in the various demobilization units which at that time were springing up all over Britain. Most of us, needless to say, chose the second course and so the Raiding Support Regiment was officially disbanded and its short, but exciting and turbulent history, came to a close. It is interesting to note that, during the entire history of the Raiding Support Regiment all personnel were paid and administered on impress accounts of their original unit, and this evidentally was the case in many similar small special service units that were born during the war and died at its conclusion.